“You must be 150 years old,” interrupted an audience member, as Jon R. Friedman talked about his evolution as an artist at Cotuit Center for the Arts recently. We all laughed, but we, too, were awed by Friedman’s accomplishments—surely it would have taken more than one lifetime to become so expert in each of these diverse genres of art. 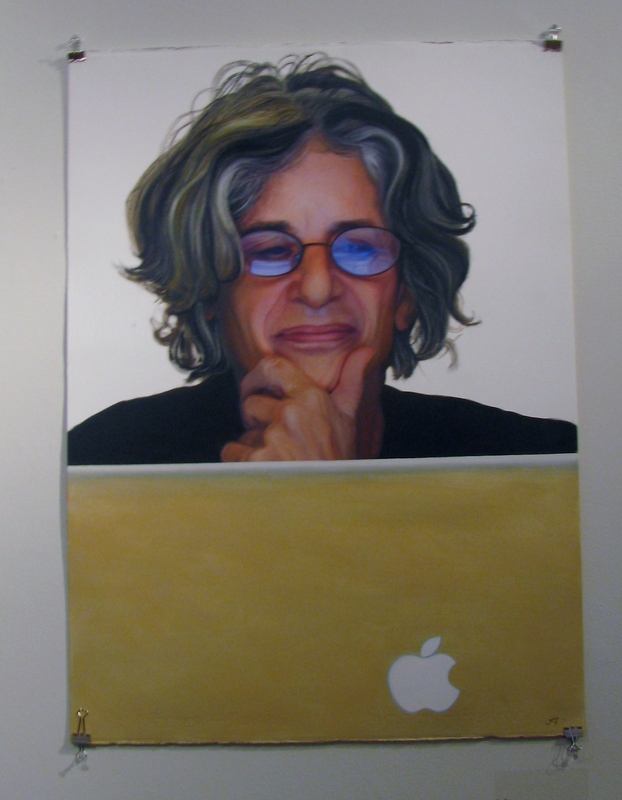 Friedman, whose portrait studies are on exhibit at the art center through July 22, gave an illustrated talk on his work on June 20. The range and originality of his work was astounding. His slides ranged from abstract geometrics to sculptural assemblages and site-specific installations, to pastel landscapes and animal images to singularly expressive portraits for which he is best known. His show at CCftA, “Jon Friedman: Notables and Friends, Contemporary Portrait Studies,” is a magnificent display of oil-on-paper studies made in preparation for final portraits. Many of them have an informal, almost unfinished look that adds to their vitality. 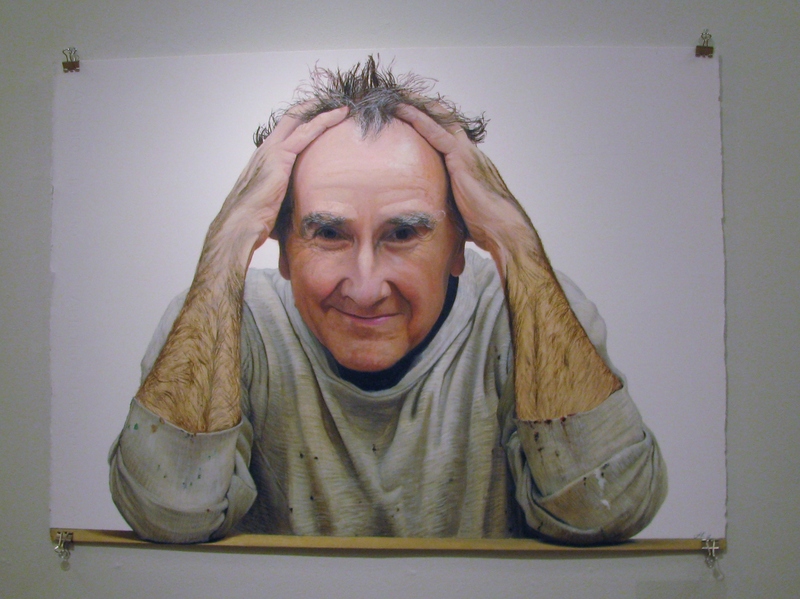 Like his final portraits (copies may be seen in a large binder available at the exhibit or on Friedman’s website), they are not only accurate representations of their subjects, but they show a bit of the personality, accomplishments, and interests of the subject. Unlike conventional portraits, which can be humdrum and wooden, Friedman’s portraits capture the passion, the zest, the energy of the people he paints, incorporating personal passions, professional accomplishments and personal histories into his portraits. 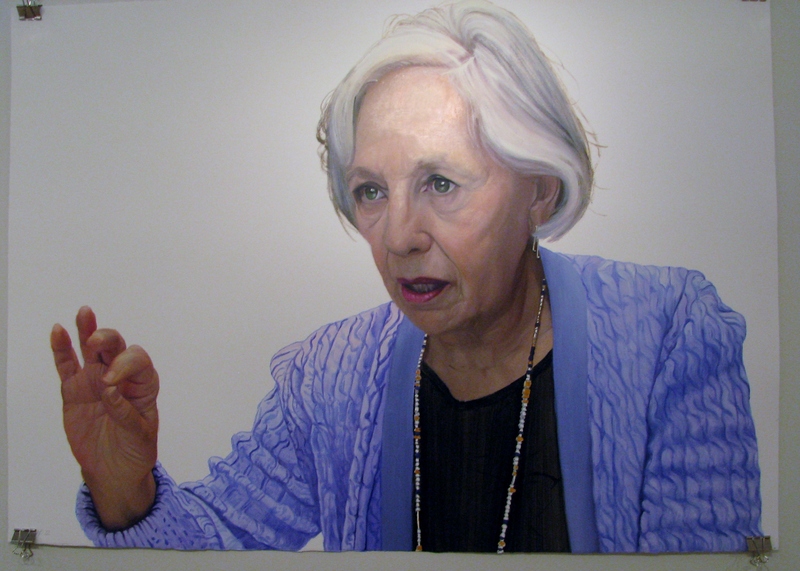 Friedman’s commissioned portraits are primarily of noted professionals in the fields of science, academia, the arts, and commerce, in recognition of their achievements and position. Numerous institutions and organizations in the United States and abroad have commissioned his work, including the National Academy of Sciences, the Royal Society (UK), the Royal College of Surgeons (UK), Swarthmore University, MIT, the University of Pennsylvania, Brandeis University, the U. S. House of Representatives, the U.S. Court of Appeals, the Carnegie Institution, the National Institutes of Health, and Memorial Sloan Kettering Cancer Center. I had the pleasure of talking to Jon about his work. He is a warm and vibrant person himself, and he generously shared his thoughts both with me and during his talk. 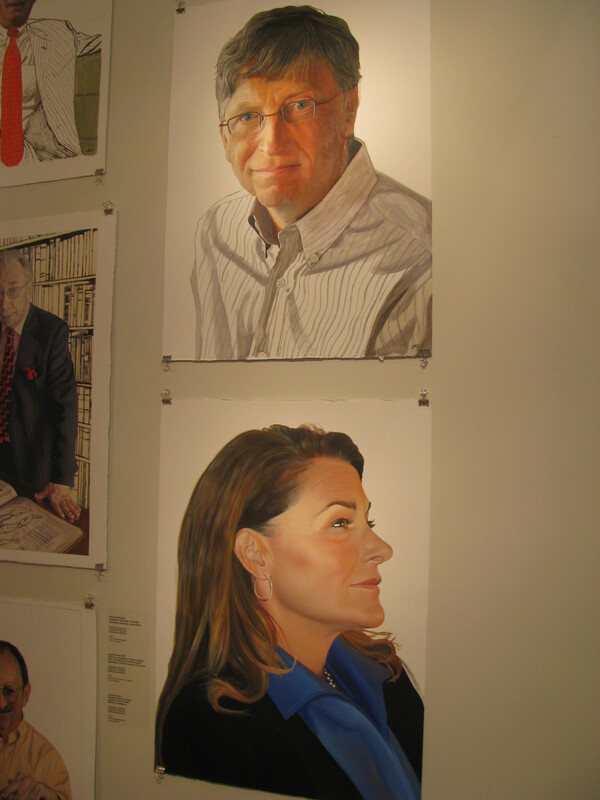 Friedman, who spends half the year in New York City and half in Truro, is perhaps best known for his portrait of Bill and Melinda Gates, commissioned by the National Portrait Gallery for its “Twentieth-Century Americans” collection and unveiled in May of 2011 at the gallery. The National Portrait Gallery has also acquired five preliminary studies of other Friedman portraits for inclusion in its permanent collection. The portrait may be seen on the National Portrait Gallery site. The Cotuit exhibit does not include studies for the official portrait, but it does include two individual studies of Bill and Melinda, made after the portrait was finished. Normally, Friedman takes time to get to know his subjects and what is important to them before he paints them. He will spend a day with them, sharing a meal, talking, observing how they move and communicate. He is not necessarily seeking a photographic likeness (though he does achieve this), but rather an expressiveness of face, hands, and body that captures elements of his subject’s personality, history, and accomplishments. This kind of work takes time and attention to detail, and Friedman likes to spend plenty of time getting to know his subjects and working with them toward a final product that both are happy with. Bill and Melinda Gates, however, are busy people, and Friedman was allowed only 45 minutes to work with them and no prior communication with them. He spent the time taking digital photographs of the couple in various sitting and standing arrangements, all the while talking to them, particularly their work with the Bill and Melinda Gates Foundation, which would be featured in the final portrait. In his slide show presentation, Friedman showed, in quick succession, the thousand or so photos taken during the shoot. He makes no attempt to pose his subjects, he said. He is looking for natural poses and expressions and wants his subjects to feel at ease. Ninety-five percent the photos he takes are not usable, Friedman said, but he may find just the right hand gesture in one, the tilt of the head in another, a facial expression in yet another, and much of his effort involves combining these elements in the final composition. This particular day was scheduled as “a day of hateful activities,” they were headed for another photo shoot immediately afterward. “They weren’t happy campers,” said Friedman. He tried various combinations of the Bill and Melinda sitting and standing before coming up with the final, in which Melinda is sitting in the chair and Bill is sitting on the arm of the same chair. At this point he made a number of oil studies on paper, each taking a couple of days to complete. Using images and information he found online, Friedman created his own composite screen with the foundation’s motto, “All lives have equal value,” and images reflecting the foundation’s mission of helping people live healthy, productive lives by improving health care, agricultural productivity, education, and science and technology, particularly in poor countries, as well as using computer technology to evaluate the success or failure of their programs. Again, he used Photoshop to manipulate the images until he found a composition he was happy with. He presented it to the National Gallery for their input before finalizing the portrait design. “Backgrounds are almost never something that actually exists,” Friedman said. His backgrounds contain carefully chosen (by himself and by the portrait subjects) objects and symbols that provide additional insight into and information about the subject. Again, he is not going for photo-realism. He said he does not use true perspective, and he plays with color and space to achieve his end. After all the preliminary composites and studies, Friedman may take another three months to complete the final portrait. The Bill and Melinda Gates portrait presented some additional challenges, notably because he had not had much experience painting women. “I was sort of flummoxed” by Melinda, he said. “I was having a very difficult time getting her face to feel right to me.” He finally realized that Melinda’s makeup was the problem. He was not used to painting skin with makeup on it. “It was almost as if the face had been painted before I started to paint,” he said. Eventually he worked it out, learning a lot in the process. Even as a child, Jon always knew he wanted to be an artist, but he thought it would be a serious hobby, rather than a career, since that was his father’s experience. His early artwork was very abstract and geometrical, not very much like his warm and engaging portraits. His route to the becoming a portrait artist is a fascinating one, as he explored, and continues to explore the many possibilities of artistic expression. Expecting to have to earn his living in another field, Friedman earned a B.A. in philosophy, but continued to study art in college and graduate school. His first works were abstract, “completely nonobjective” paintings, but he always “bounced back and forth” between representational and nonrepresentational art. In the late 1960s, his focus was on large (8 by 14 foot) abstract color-field acrylics. His pieces tended to be very geometric, and he used paint in deliberate ways, such as cutting up dried paint and fitting it back together again like mosaic chips. He made color columns four to six feet tall by layering paint as structural elements, each taking as long as a year to complete, as it took some time for each layer to dry. View the color column here. After graduate school, he worked for a municipal agency whose intent was to beautify the city with public art. He painted huge murals on the sides of buildings and one that wrapped around four walls of the unemployment office. Unfortunately, Friedman said, the city had “no taste for abstraction,” so he had to incorporate representational elements into his work, as in this public utilities mural. View the public utilities building. His paintings of this period are no longer abstract; they are highly detailed, but slightly surreal watercolor representations of the wild environment: the forests, the dunes, the trees, the meadows and marshes, the wildlife. That experience gave Friedman a desire to “come out of the flat wall” and create painted constructions. He installed shallow sculptures on the wall and extended them by painting directly on the wall on the wall around them. Some were very representational images of plants and animals, while others were increasingly abstract, influenced by Calder. Some of the sculptures were small and jewel-like, featuring glass, copper, feathers, and other materials. Friedman was living in New York at this time and found the city a “cornucopia of materials” for his work. He uses materials in the flower district and used scraps of metal and other materials. The bigness and the boldness of the animal portraits inject an element of humor into the pieces. It was his father who was responsible for Jon’s shift to portraits. Herbert Friedman, an astrophysicist, wrote a book in 1990 on 20th century astronomy and cosmology called “The Astronomers’ Universe.” It contained 20 or so short biographies of scientific notables such as Enrico Fermi, Albert Einstein, and Robert Oppenheimer, and Herbert, always a supporter of Jon’s artwork, asked him to create charcoal portraits of the scientists to illustrate the biographies. Herbert Friedman had started out as an artist himself, but, according to Jon, had “a terrible art teacher and a great astrophysics teacher” at Brooklyn College, and thus turned his attention to science. At the same time, Jon was asked to create a group portrait of a family who had purchased some of his landscape pastels. Feeling that such an assignment was “way out of my league,” Friedman spent a week with the family, photographing them outdoors and indoors, in all sorts of combinations. The young son, Freidman said, was rebelling against being part of the nuclear family, so the final portrait shows him in the foreground, but at the edge of the grouping, as the others relax around the dining room table, the father looking up from his newspaper, the mother and daughter perhaps interrupted from a conversation as the viewer enters the room. It is an unconventional family portrait, showing not only the details of the family home (with one of Friedman’s pastels in the background), but also a glimpse into the relationships among the family members. Meanwhile, the simple charcoal sketches of notable scientists attracted the attention of the American Academy of Sciences and the American Philosophical Society, both of whom exhibited his work. That led to commissions from a wide variety of scientific and professional organizations who recognized Friedman’s talents and asked him to create more formal portraits of luminaries such as Bruce Alberts, president of the American Academy of Sciences, Herman Goldstine, Executive Director of the American Philosophical Society, Carl Kupfer, founding director of the National Eye Institute at NIH, Dalip Singh Saund, a posthumous portrait commissioned by the United States House of Representatives, William Steele Sessions, director, Federal Bureau of Investigation, and Maxine Singer, president of the Carnegie Institute of Washington and recipient of the National Medal of Science. Though these portraits are quite different from the type of art Friedman was accustomed to doing, he said he has “grown to love” not only painting the portraits, but the preparation, the getting to know each of his subjects, the details of each painting: the expression of the face, hands, and body, the meaning in the choice of clothing and the background features. A striking portrait of one scientist presents him in a seemingly unprofessional bold tie full of bright yellow smiley faces (both smiling and sticking their tongues out). Bruce Michael Alberts is a biochemist and was president of the National Academy of Sciences from 1993-2005. He also served as editor in chief of “Science” magazine. His focus is on improving the elementary and middle school science curriculum. He wears the tie when he goes out to meet with school children to talk about science. It serves as an ice breaker, and the kids immediately warm up to him and his message. Thoracic surgeon Larry Kaiser wanted to be painted in the surgical theater, attired in surgical garb. Friedman was initially daunted by the setting, with its unforgiving lighting and chaotic assortment of tools and equipment. “I knew I wanted to feature his hands,” said Friedman, as they are “essential to the craft of surgery.” After adjusting the lighting, Friedman took numerous photos of Dr. Kaiser’s hands and instruments before coming up with a final concept, adding a surgical mask for good measure. It takes months to create the portraits. Friedman likes to spend at least a day getting to know the person he will be painting, talking, sharing a meal with him (or her). On a subsequent say, he will schedule a photo session, taking hundreds, perhaps thousands, of digital reference photos, which he later assembles to create a series of compositions, cutting and pasting his images in the computer before coming up with composite photos from which to paint. Sometimes he has trepidations about a subject. He was not sure that he would be comfortable paining William Sessions, former head of the FBI, but he found Sessions to be a “very charming man with a lot of integrity,” proud of his accomplishments at the agency and as a judge. He had computerized the FBI’s fingerprint file and incorporated the use of DNA evidence. He was a staunch supporter of the Bill of Rights. Friedman’s portrait of Sessions shows images relating to the fingerprint files and DNA evidence in a border along the left side. A coat rack holds his judge’s robes, and a copy of the Bill of Rights is displayed on the wall behind him. Friedman said that, to make an accurate copy of the Bill of Rights, he projected an image of it on his canvas and traced the words. In contemporary paintings, ties can add “splashes of color and can enliven a portrait,” he said. Friedman sometimes encourages his subjects to remove their suit jackets; he paints clothing wrinkles, folds, and all. Choice of background objects adds meaning to the portrait. Most elements are chosen by the subject, but it is Friedman who combines them into an effective arrangement. Sometimes the background objects can tell the subject’s entire life story. The portrait of Congresssman Dalip Singh Saud, the first Asian member of Congress, was done posthumously, as Singh died in 1973. Friedman’s portrait of Congressman Saud, who came to this country from India when he was 20, shows him standing in the Capitol building. To the right is a panel with a series of symbols representing what was important to him: images of Abraham Lincoln, Woodrow Wilson, and Mahatma Gandhi from whom he drew inspiration, an ox-cart representing the rural farm village where he was born, a panorama of irrigated fields, a farmer, and a tractor, representing his successful career in agriculture in the U.S., flags of the U.S. and California, a differential equation symbolizing his degrees in mathematics, and more. Next Friedman spends about six months on oil-on-paper studies for the final painting, sharing them with the subject and continuing to tweak the painting until it is just right. “For me, confronting each new subject is like setting foot for the first time in a foreign country. The studies are exploratory journeys. I feel as though I am scouting out the lay of the land, growing comfortable with the topography of my subject’s face, learning to understand the linkages between my subject’s character and features. The exhibit at the Cotuit Center for the arts includes many of these studies, both for commissioned portraits and for portraits of family and friends. Generally, when he creates a commissioned portrait, he keeps the studies to show in exhibits such as this one. 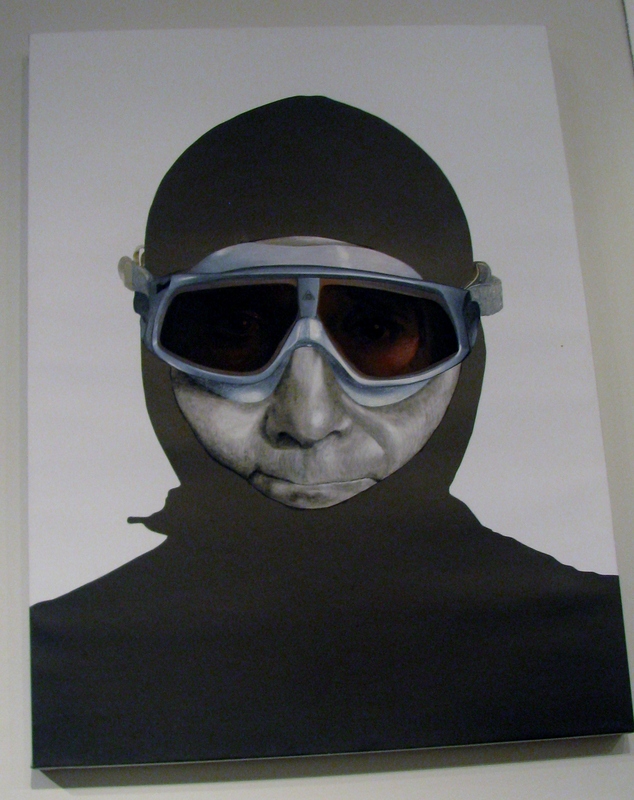 There are several informal self-portraits, often with a humorous touch. 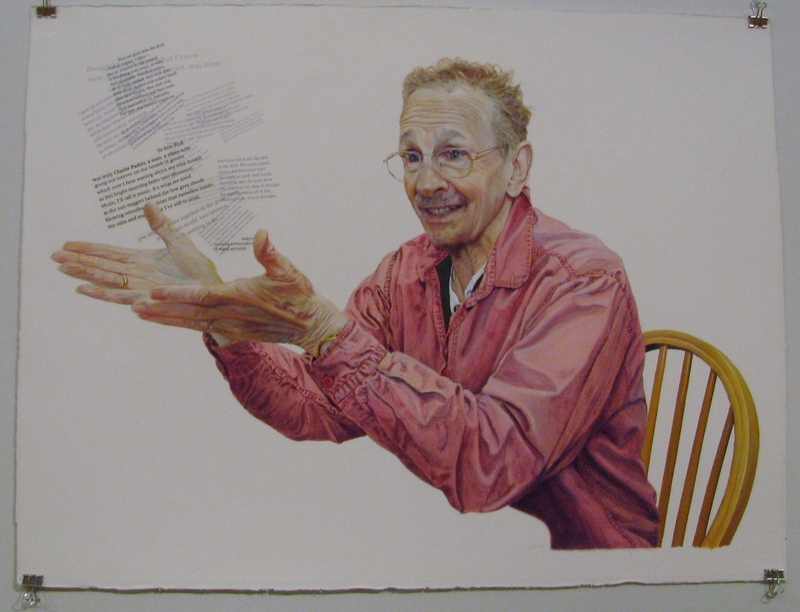 Portraits of poet Phil Levine show words emanating from his fingertips. 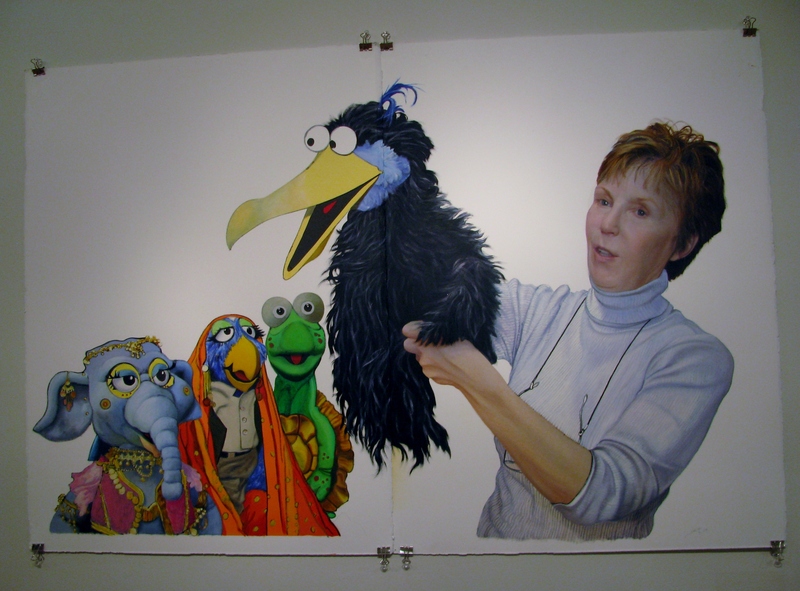 Kathy Mullen, a puppeteer, is shown with her puppets, presented with a cartoon-like flair. Also in the current exhibit is a study of biochemist Maxine Singer. He had painted an official portrait of her 10 years earlier, one of his only professional portraits of women. But he was not happy with his original portrait (“I just wasn’t good enough then,” he said), and wanted to do one that presented her more effectively. He is happy with this one. Hands are interesting to Friedman. He thinks that the hands should not lie limply in the subject’s lap for a portrait, but, rather, should usually be engaged in expressive activity. “There is an element of theater, of dramatic narration, in many of my portraits. The face might be considered the protagonists, but the face is usually not on stage along. It is part of an ensemble. Hands are dramatic players as well, assuming an important role as supporting actors (sometimes vying for the lead). And hands, like faces, are palimpsests, revealing the passage of time and vagaries of uses. “Usually the hands speak in concert with the expressions of the face, adding emphasis and punctuation to the communication of the eyes and mouth. But some people’s hands seem to have their own independent and revealing personality. Out of the spotlight, ‘off camera,’ they can be more unguarded in their expression than a sitter’s face, which often starts out hiding behind a public mask. The hands of musicians are particularly interesting and he has sought out musicians as portrait subjects. 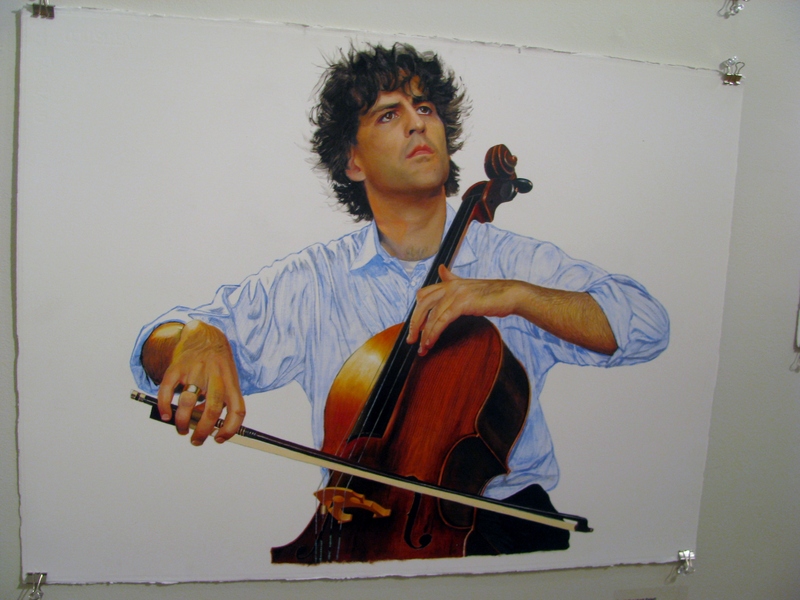 Friedman’s portrait of Amit Peled came about in a unique way. A young Israeli cellist, Peled began coming to the Cape to study with Bernard Greenhouse in Wellfleet. Friedman saw him play at a performance at the Wellfleet public library and was taken with his striking visual presence. Friedman knew he wanted to paint Peled, but was shy about approaching him. Knowing of his interest in Peled, Friedman’s mother intervened. She saw Peled at a concert in Washington DC and had no qualms about walking up to him and telling him, “My son is a painter, and he would love to paint you.” Peled agreed. Friedman sat in on rehearsals, getting to know Peled, taking photographs, and determining the best way to capture the musical energy of the cellist. 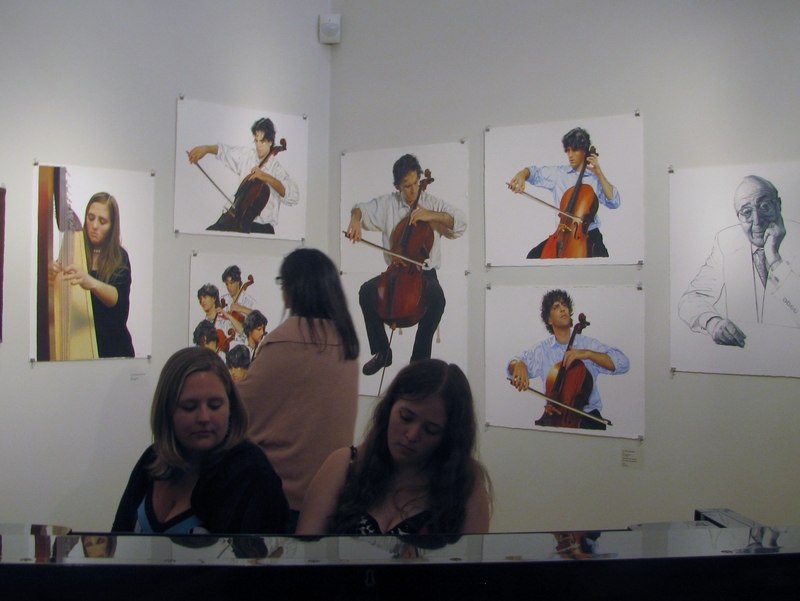 Peled used the resulting portrait on the cover of his recent CD, and Friedman shows the studies in art shows. They may be seen at the Cotuit show, and made a terrific backdrop with Amit Peled himself came to perform at the center recently as part of the Meetinghouse Chamber Music Festival. 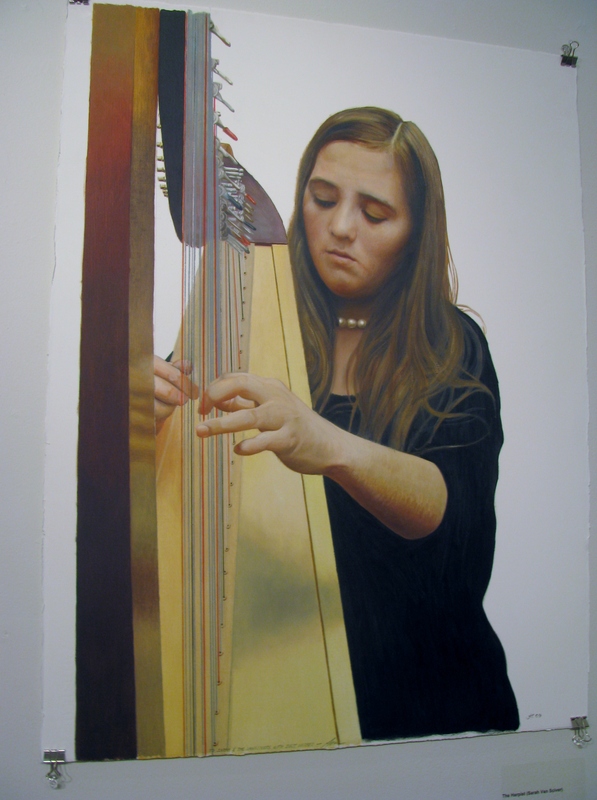 Next to Peled’s studies was a portrait of Sarah Van Sciver a young harpist and pianist, whose mother, Maggie Van Sciver, curated the show. Sarah played the piano at the opening reception, while the portrait of her playing the harp hung in the background. What’s next for Friedman? No doubt he will continue to create striking portraits of professional scientists, government leaders, and other luminaries, as well as his more informal portraits of family, friends, and private commissions. He would like to paint more woman and people of color. And he continues to paint landscapes and other genres. Friedman said he has learned a great deal in his years of portrait painting, but he still feels he has much to learn. When he goes to art museums now, he feels like he is looking at the portraits with a completely different eye from the way he saw them 20 years ago, that he is engaged in a very different conversation with the artists. An audience member asked him if he thought about combining his love of abstraction with his talent for portraits. Friedman said that his growing comfort with portrait painting has given him the confidence and ability to take more risks with his painting, and the preliminary work that he does in his sketches enables him to be a little more adventurous in the final product. Combining abstract elements with his representational portraits was part of this growth, he said. Friedman’s works may be found in both the main and upstairs galleries at CCftA. Also upstairs is a portrait exhibit curated by Friedman and Van Sciver. That show includes portraits in all media by Cape Cod artists. Cotuit Center for the Arts is a 4404 Route 28 in Cotuit. The gallery is open Monday through Sunday from 10 AM through 4 PM and may also be viewed in the evenings when the center is open for theatrical or musical performances. Admission to the gallery is free. Thanks, Doris! He is an amazing artist, and a wonderful speaker.